Aluminum post 55 cm height, one module for APRO/VEDO and PASSO. Pack of 2 pcs. Aluminum post 110 cm height, one module for APRO/VEDO and PASSO. 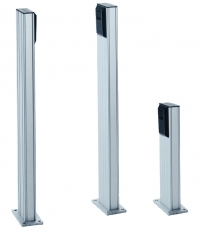 Aluminum post 110 cm height, two module for APRO/VEDO and PASSO. Post for FT201 SINCRO. 54 cm height. Pack of 2 pcs. Post for double photocell FT201 SINCRO. 100 cm height.